Other highlights include bright planets and two asteroids. The month of April is named after the Latin Aprilis, which means to open. That is what the buds, leaves and flowers will be doing this month in the northern hemisphere as we tilt more toward the sun once again. This is further tipping the balance point of the earth reached on the vernal equinox that will continue until the summer solstice in June, when the sun will reach its highest and most glorious point in our sky. This is the first full month of spring, but as T.S. Eliot says, “April is the cruelest month.” Winter is still in full swing in the White Mountains and its surrounding towns. Deep snow covers the countryside, and it was 1 degree on the summit of Mt. Washington, with a sustained wind of 38 mph on the last day of this winter. Its brilliantly gleaming white peak and deeply etched ravines were outlined in stark contrast against the flawless blue sky. The regal presence of this highest peak seemed to survey all of New England effortlessly, and with unending calm and a great sense of serenity and peace. We often forget how close all of this wonderful beauty is to us in this area and how lucky we are to be able to enjoy it and learn more about it. We are all a part of this natural world on the surface of the earth, as well as the infinitely greater but just as natural world that stretches way beyond our surface into the more unfathomable and mysterious depths of space. This will be a great month to further explore those depths, as the nights will be warming up even as they get shorter. Many highlights await us, including four of the five brightest planets gracing our morning sky, Mars and the moon dancing through Taurus, close lunar conjunctions with Jupiter and Saturn in the morning sky, the Lyrid meteor shower, and even two asteroids visible with binoculars or a small telescope. Venus continues to slowly sink farther into the morning twilight, and it now rises only one hour before sunrise. However, our first planet, Mercury will join it for most of this month, reaching greatest western elongation from the sun on April 11. You may need binoculars to spot them. Notice that Venus is about 40 times brighter than Mercury. When you look at our first planet this month, be aware that we launched a mission last October that will take seven years to get there, even though it is not that far away. Both Jupiter and Saturn continue to rise earlier and climb higher into our morning sky this month. Jupiter rises first, around 1 a.m., and by the end of April it will rise by 11 p.m. The king of the planets will stop its direct, eastward motion and begin its retrograde motion on April 10, exactly two months before it reaches opposition. Notice that Jupiter is slowly getting brighter and that it is about 15 times brighter than Saturn. Jupiter is still in Scorpius, and after it starts its westward motion, it will be inching closer to the bright star named Antares, which means rival of Mars. Antares and Betelgeuse in Orion are similar. Both are huge red supergiant stars near the end of their lives. They are each about 600 light years away and about 700 times larger than our sun, which means that if you could place either of these giants in our sky where our sun is located, the orbits of all the planets out to Mars would fit inside the surface of these monster stars. On Earth Day, April 22, the moon will be just above Antares, and the next morning it will pass within one degree of Jupiter. Then keep following the moon through Sagittarius, and watch it pass very close to Saturn just two days later, on the 25th. Saturn also begins its retrograde motion on the 29th, 19 days after Jupiter. Then Mars remains as the sole evening planet. Watch it closely as it is making a scenic trek through Taurus, pointing out some of its highlights along the way. The red planet begins the month just below the Pleiades and will then pass right between the Seven Sisters and the Hyades with Aldebaran, marking the eye of Taurus the Bull. Compare these two red orbs and you will see that the star is twice as bright as the planet. Also notice the bright red color of Betelgeuse, about another 15 degrees to left of Aldebaran. It is about another four times brighter than Aldebaran. Keep watching as a slender waxing crescent moon passes near the pair during the evenings of the 8th and the 9th. The annual Lyrid Meteor shower will peak on the morning of Monday the 22nd, which is also Earth Day. You could normally expect up to 20 meteors per hour emanating from Lyra in the Summer Triangle, but this year the full moon will occur just three days earlier, washing out much of the action. The meteor shower is caused by the earth passing through the debris trail of Comet Thatcher; there will be a short window to catch some of these tiny, sand grain-sized particles burning up high in our atmosphere before the moon rises at around 11 p.m.
Not one, but two of the largest asteroids will be at their best this month. The brighter one is Pallas, which will reach opposition on the 6th near the bright star Arcturus in Bootes. It will get as bright as 7.9 magnitude, which is about the same as Neptune, so you would need binoculars or a small telescope to spot it. Pallas is about 300 miles in diameter, which is not quite large enough to spin itself into a round shape. The other asteroid is named 7 Iris, and it is a little smaller and fainter. It is only 120 miles in diameter and will reach only 9.4 magnitude, or about three times fainter than Pallas. You can see it with a telescope all this month in Virgo near a nice galaxy named M104, the Sombrero Galaxy, located about 30 million light years away in the Virgo Cluster of galaxies, one of about 2,000 galaxies living in that nearby cluster. That may seem far away, but this is really our own celestial backyard. To bring it even closer to home, our very own Milky Way is one of more than a million galaxies that are part of the Virgo super cluster of galaxies stretching over 100 million light years across. April 1: In 1997, comet Hale-Bopp made its closest approach to the sun. This was a once-in-a-lifetime comet that hung around for a whole year and was easily visible with the naked eye as its tail stretched over a quarter of the sky. April 2: The moon is near Venus this morning. April 5: New moon is at 4:52 a.m.
April 7: The Compton Gamma Ray Observatory was launched in 1991. April 8: The moon, Aldebaran, Mars and the Pleiades form a celestial diamond in Taurus. April 11: Halley’s Comet made its closest approach to Earth in 1986. April 12: First quarter moon is at 3:07 p.m. Yuri Gagarin became the first human to orbit the earth in 1961. John Glenn would be a close second on Feb. 20, 1962. April 13: The moon will pass near the Beehive star cluster in Cancer tonight. 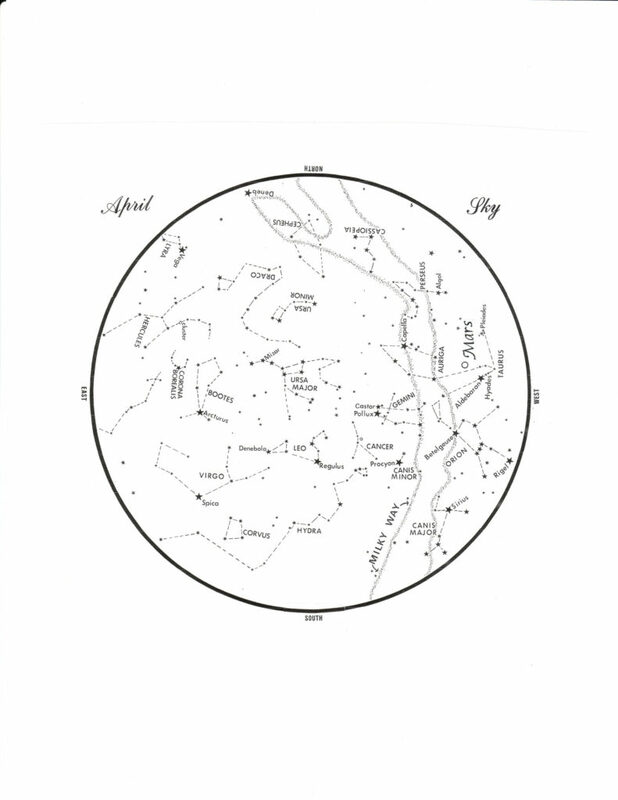 April 14: The moon will pass within 5 degrees of Regulus in Leo tonight. April 19: Full moon is at 7:13 a.m. This is also called the Grass, Egg, Pink or Fish Moon. April 22: The Lyrid meteor shower peaks this morning. The moon will pass near Antares. April 25: The Hubble Space Telescope was launched on this day in 1990. Designed to last only 10 to 15 years, it is still going strong 29 years and more than one million amazing images later. Our knowledge of the universe and where we really live has vastly expanded over those 29 years, thanks to its incredible discoveries. The moon will pass near Saturn this morning. Saturn will be occulted by the moon for parts of the world on the morning of the 26th, but not for us. April 26: Last quarter moon is at 6:19 p.m.
April 30: Frances Wright, an American astronomer who taught at Harvard, was born in 1897. She taught celestial navigation to naval officers and wrote three books on the subject.